You know sometimes when it’s like pulling teeth to finish a project and finally you just muster through, just so you never have to look at the dumb thing again?? I know it’s not just me. This quilt was like that times ten. 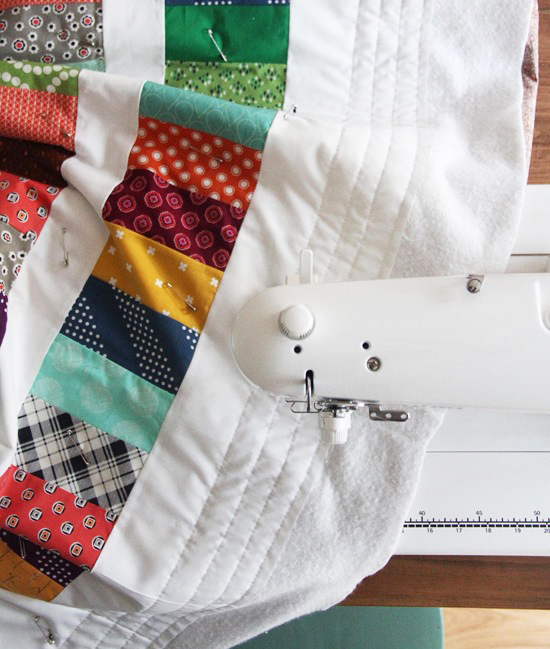 I had tons of bad machine issues while finishing this quilt…like when I broke my first Juki the same day I opened it. Whoops! Then I tried to quilt it with “organic” straight lines…but it just looked like I couldn’t sew a straight line a thousand times over the quilt top, and the walking foot went haywire and it wasn’t worth unpicking. So that, along with lots of other reasons, put this low on my list of quilts to finish. I finally put on a good show (Poldark…so good!) a couple of weeks ago and quilted it with some more crooked lines and bound it. Hooray for finishes!! You powered through and it all counts. LOL. Glad you worked through your frustrations as I like the finished quilt. Animals need quilts so no one should yell! I get it. I had a similar experience with two small quilts. Finished them up with all their imperfections and gave them to the cats! I would certainly be happy to picnic with the quilt! It passes the 10ft test with flying colors. We would have never know if you hadn’t mentioned it! I love REAL people like you! 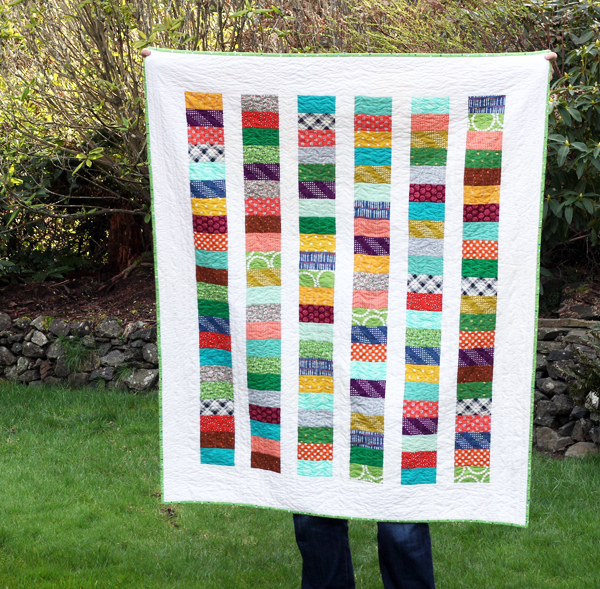 Such a cute quilt and such a lucky dog! Nice to know we are not the only ones who have such frustrations! Congratulations on finishing it. It looks great; love the fabrics! I’m with Debbie up there a few comments ago…..Thanks for being normal…..and the giggle! I LOVE this quilt though. You know – I just see a lovely, cuddly quilt! But I know the frustration – glad you finished it! Memories :)! It is very frustrating when our machines act up, isn’t it? Your quilt turned out lovely in spite of the problems. And I’m sure the dog loves it. So wonderful that you dog is so loved….way to go…. Well, it looks lovely in the photos and I think it’s good to have a quilt you don’t care too much about around the house. My “car quilt” is one of those. I can relate! Glad you finished it, our doggies need a little comfort too. Haha, I’ve definitely had projects like that! My cat claims pretty much all my quilts, even before they are finished! I love that you gave it to your pup…..they need “love” quilts, too! Aww, and I bet he appreciates his own quilt! 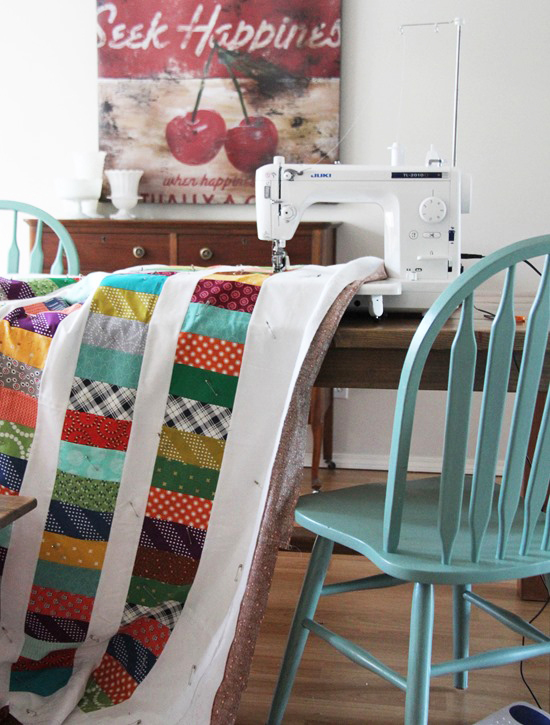 It honestly looks great in the pics, but it is so very nice to read a blog post by an expert quilter who has a quilt she didn’t love. I read on a quilt blog once, “better finished than perfect” and that was my mantra as I completed my first quilt. You have given me encouragement to cut into my fabric for my next quilt! If I think it’s ugly or filled with mistakes, my puppy will love it! Have a great day, Allison! It is a lovely quilt. But, I’ve had projects like that where it seemed to be cursed. can you really hear me yelling at you all the way from Saskatchewan ??? I like the 10 ft test too and it looks good from here. Any good dog that lives with little kids deserves something soft to sleep on! Pets are family too and they need quilts! Oh, gosh. I have TWO of those — really heinous Star Wars/superhero monstrosities, and I’ve shoved them into the back of the closet, but I can feel them lurking there, in the spidery darkness, staring at me. All. the. time. Lol Vicki this made me laugh!!! Allison, I would never protest over a quilt belonging to a dog. Picnic quilts are great too. It looks really great in the photos and I guess we just can’t see all the areas that bother you. I was planning to do some organic slightly wavy matchstick quilting and it never occurred to me that it might just look like I cannot sew a straight line, LOL. Maybe I’ll make them wavier. :) I have to go read about your Juki mishap now. Every member of the household needs a quilt!!! Love that you felt you needed to “qualify” why the dog is getting it! I soooo understand where you are coming from. And dogs appreciate quilts… Don’t they always sneak up on the bed to lie on yours? Oh wait, they are lying on the bed you say, not the quilt… Potatoe… Potatoe (you are supposed to say that word 2 different ways) I choose to believe they love my pretty quilts. Ha! What a cute quilt. Connected Threads has a tutorial on their site for a similar QAYG version. Thanks Carla for the link!! Well luckily it wasn’t ALL my fault…the walking foot didn’t fit correctly as it should have and it threw off the timing (I think). So I sent it back the next day! Luckily the new one I replaced it with works like a charm!!! All my problem quilts will go on the couch for TV watching, which in essence means I have given them to the dogs…and cats. Same in our house Claudia! 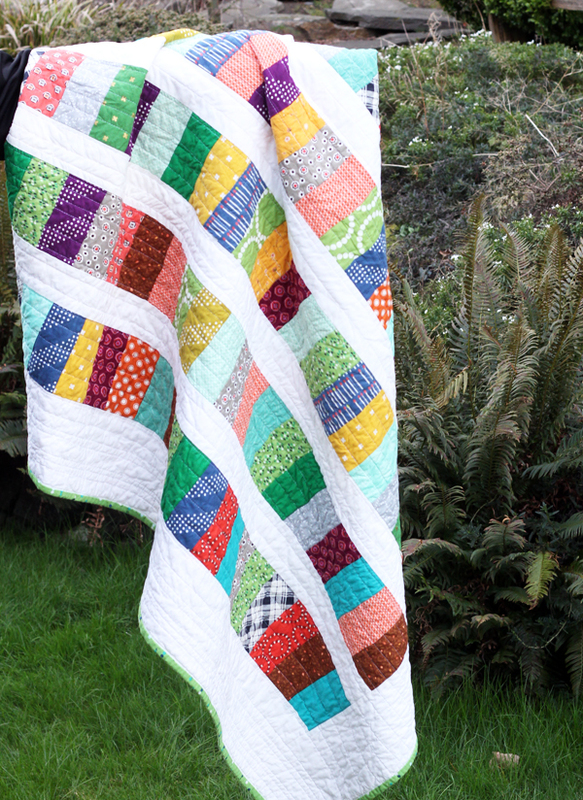 LOVE this quilt…the fabrics in it! such a bummer when there are ‘problems’, takes all the fun away! Oh my! Glad this post showed up in my inbox today! I can SO relate! For the first time ever I quit a project I was working on! My mistake was starting a baby quilt with fabric I hated but had been in my stash for about 10 years. Ugh I stuck with it for 4 hours and then asked myself why! I put it in a plastic bag and will donate it! I don’t have an elderly dog I can donate it too. Haha! Maybe I should have put it in the bottom of the bird cage! BTW, I like your quilt, excuse me, the dog’s quilt! Haha! Too funny! This looks wonderful. I love it. 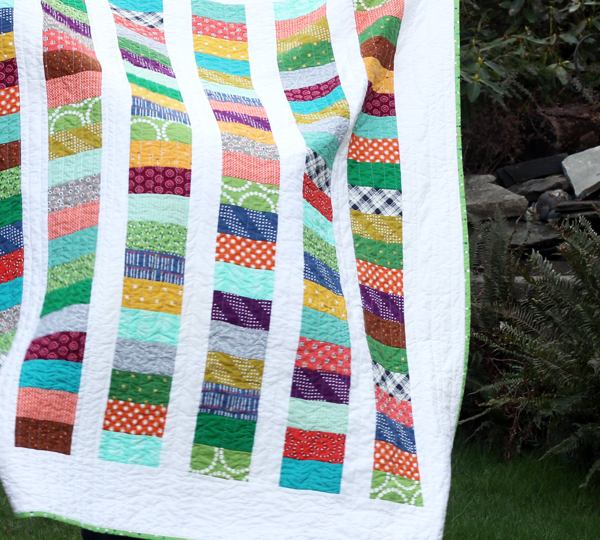 I think it’s a pretty and cheerful quilt. I think it’s great that you gave this quilt to your dog. When we had dogs I made quilts for them. Never apologise for gifting a quilt to your dog, even a less than brilliant quilt, good on ya! It sure didn’t look like a problem quilt in the pictures. I actually plan on making my cat a small quilt (well pillow) to practice FMQ. Plus the local animal shelter is looking for kennel quilts – another perfect opportunity to practice FMQ! They won’t care and I get to practice and get over my fear!! LOVELOVELOVE that quilt!!! I need to make one with all my scraps!!! My pets (a dog and a cat) get their paws on a lot of my quilts. Anything smaller than a double is fair game to them. I don’t know how my 10 pound Tabby Cat and 7 pound Chihuahua- Pomeranian mix need 7 quilts between the two of them in our 500 square foot apartment but they use them all, and are always trying to get their paws on whatever quilt I am working on at any given time. Lol. Pets love quilts to I guess. When my scotty got her muddy paws on a not so pretty quilt I was relieved, I immediately decided the quilt was hers. Thank you for this, I started a picnic quilt two years ago, and I feel the same way about it as you do your scrap coin quilt. Seams don’t line up, my straight line quilting is a hot mess, tension issues and well the list goes on.. I pulled it out of the closet this weekend ready and determined to finish it, I mean after all it’s just going to be used for picnics. Fingers crossed I don’t loose that motivation and just get it done already! I keep checking back…when’s that baby going to make an appearance? I can’t wait to see a photo of her!!!! I’m not due for another 5 weeks! I usually have my babies early…and I’m sure feeling it lately so we’ll see…hopefully she’ll grow a lot longer and I can keep her in there as long as she needs! ;) I will definitely share pics when she makes an appearance! It looks great! I love poldark too! Love your quilt and love even more that it for you dog – they are truly valued members of our families and deserve to have there own quilts … they sure do love them! !